BeenThere-DoneThat: The New Forest, Hampshire. High Street, Lyndhurst, The New Forest. 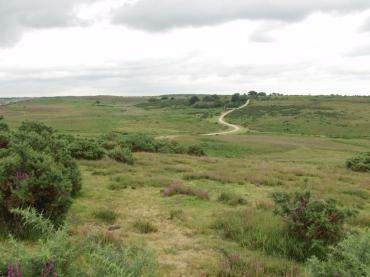 The New Forest covers an area of about 145 square miles (92,800 acres) comprised of both forest and open heath. The forested part is about half of the total and the other half consists of open heath, bog, villages and agricultural land. 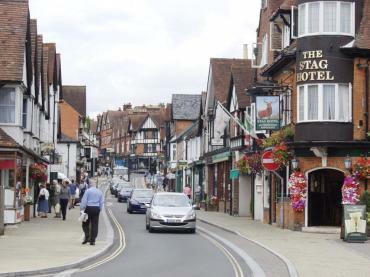 Lyndhurst is a small town about 10 miles south-west of Southampton located centrally within the New Forest area. 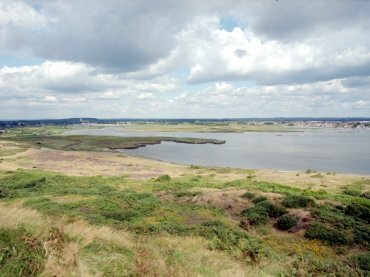 Christchurch and Christchurch Harbour, Dorset. Christchurch is only just over the border into Dorset but is still in the general area of the New Forest. This view is from Warren Hill on Hengistbury Head looking north-west towards Christchurch. Not far from the left of the picture, immediately below the horizon you should be able to see the tower of Christchurch Priory church (More easily seen in the larger picture). 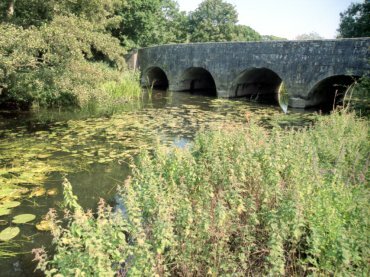 This bridge, over the Lymington River, was supposedly built in the 18th century but may be older. There is a map produced in the 16th century which shows a bridge at Boldre. Open heathland, New Forest, Hampshire. This view is looking North from Godshill Ridge a few miles east of Fordingbridge (about 7 miles north of Ringwood). You can see Gorse, Thistle and Foxglove in the foreground.